Online dating is popular and practical way for single parents to find dates. Between childcare, work, and other obligations, single moms and dads often find little time to seek out companionship and romance through traditional methods. But with the growing popularity of dating sites Australia, more and more parents are now able to find dates without sacrificing their other commitments. Online dating is a convenient and sensible choice for single parents. 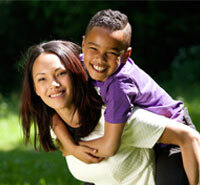 Here are some tips for getting the most out of single parent dating. Many single parents have suffered through unsuccessful relationships in the past and may feel wary about finding a new companion. But online dating sites allow you to start anew. Members of these sites are typically single parents who've endured similar hardships in their life but are looking to begin new relationships with their children in tow. Don't dwell on the past! Keep a positive attitude about starting a new relationship. Whatever life has put you through, don't be afraid to show it. Be honest about yourself when setting up your online dating profile. Don't try to impress others or misrepresent yourself as something that you're not. Showing others your everyday self will help you find someone who'll love you for the person you are. What sort of relationship are you looking for? Make your relationship goals known when you sign up for a single parents dating site. Dating is more difficult when both partners have dependent children, but clearly communicating your goals can help move a relationship in the right direction. If you meet a person and discover that something is amiss, make sure to voice your concern. It's best to resolve problems before they even start. As a single parent, you are in a situation where you're trying to provide for yourself and those who depend on you. Whatever your relationship goals may be, be a responsible parent. Stability is key to a child's development, and you work very hard to provide that. Be a good role model, and always think about your kids before making any online dating decisions. Be careful about who you meet or what kind of relationship you find. Life is unpredictable and harsh at times, but that shouldn't stop you from trying to be the best parent you can be. By signing up for single parent dating, you've already shown that you're ready for a fresh start. Make use of all the great features that online dating sites offer. And if your first tries don't result in success, give it some time: with any relationship, it's best to be certain before making a commitment. Whether you sign up for paid or free dating sites, safety is a top priority. Become familiar with online dating safety guidelines and stick with a reputable dating website. Never give away private or sensitive information, and only share what you're comfortable sharing. It's an unfortunate fact that many criminals use the Internet to steal money, access other people's information, or worse. But online dating can be a practical and rewarding way for single parents to find dates. Just be smart and have fun! With the technological advances that the Internet offers us today, the possibilities are limitless when it comes to finding and meeting people online. Online dating is a particularly useful and common way for single parents because they are some of the busiest people around. Single parent online dating offers an excellent way to help single parents find each other.